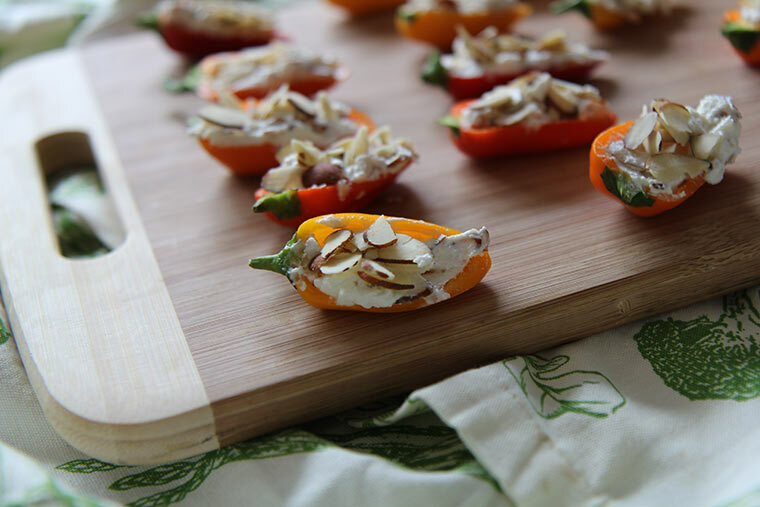 Baby sweet peppers are kind of a perfect snack on their own. They’re delicious, they’re easy, and they pair well with loads of ingredients. And this recipe for Stuffed Mini Peppers, created by Christy Brissette, MS, RD for the Almond Board of California, is a perfect example. This is one of those apps that’s guaranteed to make your guests ask you for details, but it won’t require tons of prep time or fancy ingredients. Plus, the almonds add protein, so it’s not only tasty but has enough protein to be truly satisfying. Score! Cut the baby bell peppers in half and deseed them. n a medium bowl, combine the ricotta cheese, goat cheese and nutmeg with a fork. Stir in 1/4 cup of the sliced almonds. Fill each pepper half with about 1 tablespoon of the filling from the bowl. Optional: If you’d like to have the stuffed peppers warm, broil them in a conventional or toaster oven for 3 minutes before topping with almonds.